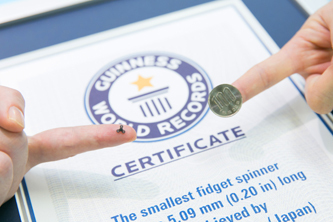 A fidget spinner using a MinebeaMitsumi’s ball bearing with 1.5mm outer diameter has been accredited by GUINESS WORLD RECORDS™ as the world’s smallest fidget spinner. Ball bearings are usually not around people’s sight, but they have received lots of attention due to the recent popularity of fidget spinners. MinebeaMitsumi is the world’s leading manufacturer of miniature and small-sized ball bearings, up to 22mm in external diameter, and has a global market share in excess of 60%. Bearings are mainly used in information and telecommunications equipment, household electrical appliances and motors for electric control systems of automobile. The Japanese company took the challenge of integrating a ball bearing with a 1.5mm outer diameter (already recognized by GUINNESS WORLD RECORDS in 2015 as the smallest commercially available steel ball bearing) on a fidget spinner.